Mac Too, built by Mangusta is an ideal yacht for charterers who prefer luxury, speed and elegance combined to make the perfect charter holiday. With an exhilarating cruising speed of 28 knots and a maximum speed reaching 35 knots, this open style sports yacht is an eclectic mixture of comfort, speed, power and sleekness. She was extensively refitted in 2016 and is in excellent condition. Mac Too also boasts a large water toy collection as well as gym equipment. Her professional crew of six will make sure her guests have an incredible time on board. A gorgeous yacht, Mac Too is maintained in pristine condition and is fully equipped to offer her charter guests with every comfort. 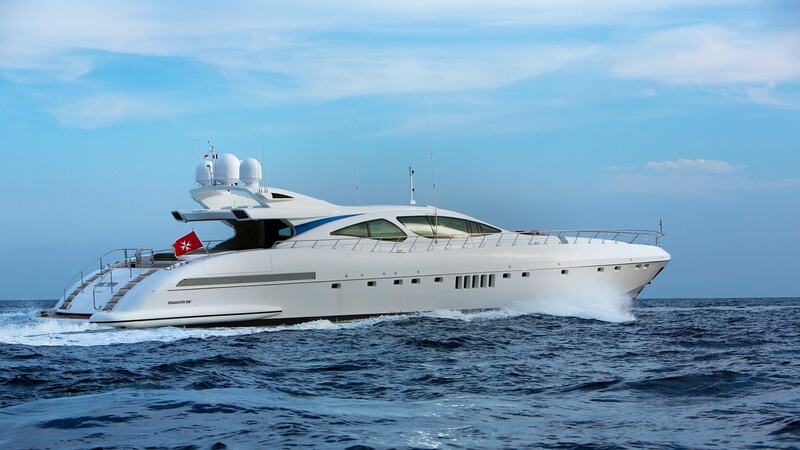 She has an impressive collection of tenders and toys and features a spacious jacuzzi on the sun deck. Her decor is minimal and stylish, with dark wood and light fabrics that create a feeling of cool but yet comfortable. Mac Too can accommodate up to eleven guests in four lavish ensuite staterooms. Her large Master Stateroom features a King-size bed, sofa, dressing room and two ensuite bathrooms – one with a Jacuzzi bath, single sink and bidet, and another one with a shower and double-sink toilets. There is also a relaxation cabin with a large square-shaped sofa, lunch table and desk area. Her VIP stateroom features a Queen-size bed, sofa, vanity and an ensuite bathroom with a shower, single sink, bidet and toilets. The guest staterooms include respectively two and three single beds with extra Pullmans.